Nathalie Joachim teaches private students of all ages and skill levels. 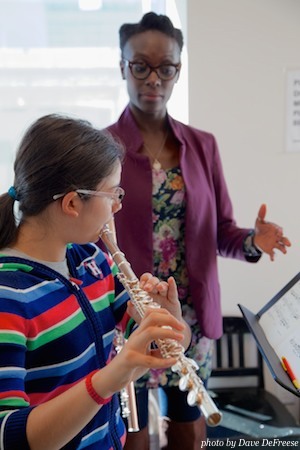 She is Director of Contemporary Chamber Music at the Perlman Music Program, and a former flute faculty member at The Juilliard School’s Music Advancement Program. Private lessons with Ms. Joachim can be arranged to take place in the comfort of your own home, online (via live video chat), out of her home studio and/or at arranged accommodations while on tour. She works with students ages 7 through university and pre-professional level students internationally. Contact Nathalie to schedule a private lesson or for more information on lessons for you or your child.